We have a number of items that make excellent gifts for stitchers. Scissors that make great gifts. Or visit our Tea Page for tea related gift ideas. If you're not sure what the stitcher in your life would like we offer Gift Cards in any value. We have a separate page for them so if you're interested in purchasing one, please click here. 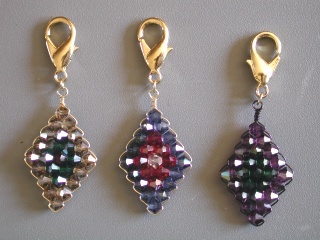 Cathe makes crystal scissors fobs woven with 28 gauge wire and either a silver or gold lobster claw. 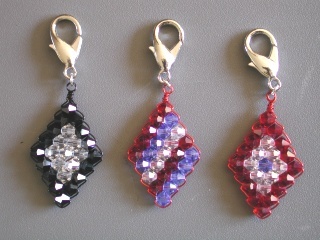 Colors change all the time so you can order a fob with your own colors. Please give us 2 or 3 colors of crystal or a family (e.g. purples) and you'll get your own custom fob. Cathe matches the wire to the cyrstal colors. They can be done a diamond pattern or diagonal stripe. These are $18/ea and usually take a couple of weeks to get made up. Accessories that make great as additions to any needlework kit or sewing case. 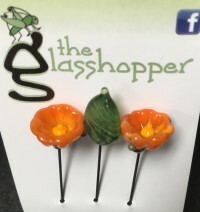 California Poppy Pin set - 2 flower pins & a leaf. 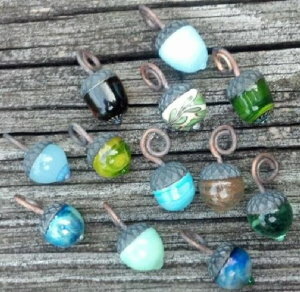 Glass acorns are a great way to make a fun scissor fob or other decorative item for yourself or a stitching friend. 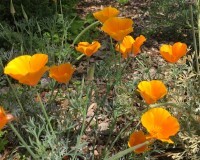 We usually have mostly more neutral colors as opposed to the bright ones. If you're looking for a specific color, contact us before ordering or make a note in the Special Instructions. Stitcher's Lotion - a lotion made to absorb quickly so you can begin stitching right away. In several fragrances available in 2oz or 4 oz tubes. Tons of Needlework stitches in PDF and JPEG format on each CD. Use as a handy stitch encyclopedia or as clip art to create your own stitch guide. You can purchase the other version from Ruth Schmuff's Bedecked & Beadazzeled store. Or the iStitches app in the Apple App Store or coming soon to Android.